With more than 30 years of experience, CENIT focuses on the development and implementation of digital manufacturing solutions. We have a background and a home base in offline-programming, simulation and process integration for robots and special machines. In addition to these OLP applications, customer-specific software developments and high-level implementation services are provided to successfully address requirements that are not covered by standard software solutions anymore. Thanks to this experience, CENIT has become a key player and strategic implementation partner for many leading OEMs and suppliers in the Aerospace and Automotive industry as well as for niche solution providers. CENIT will present the latest version of FASTSUITE Edition 2 – the next-generation 3D simulation software for the digital factory. 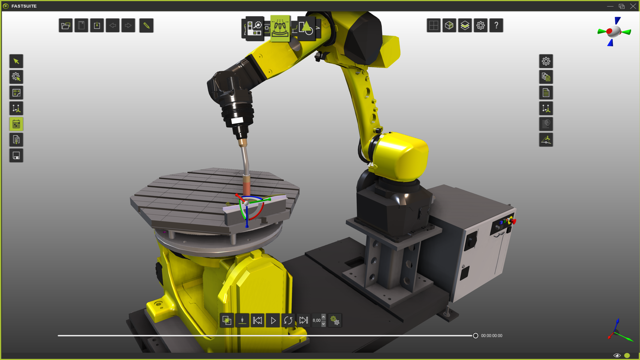 The new features in short: The software has already scored big points in offline programming of complex robot applications, but this has now been radically expanded to include functions for layout planning, PLC validation and virtual commissioning. CENIT will demonstrate the entire production process live, based on HIROTEC, a tier one automotive supplier scenario – from Component and Layout generation all the way to Commissioning – with full use of the concepts and possibilities of Industry 4.0 and the digital twin. 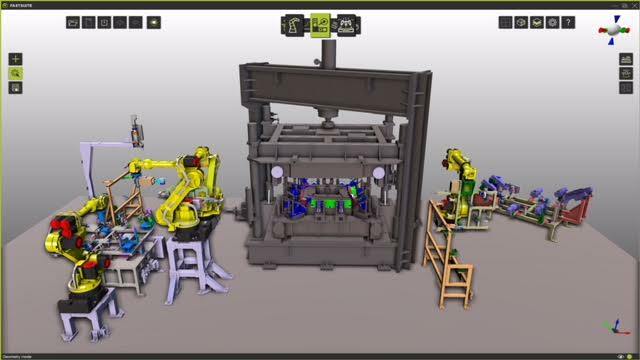 The virtual model of the facility shown – and the real facility as well – is connected online with a FANUC robot controller and a Mitsubishi PLC. FASTSUITE, CENIT’s software, supports system integration companies and end users in the areas of robot & work cell offline programming and simulation, controller validation. virtual commissioning as well as full factory simulation. With FASTSUITE Edition 2, our stand-alone simulation platform, it is our ambition to support production processes with best-in-class software technology for the entire Digital Manufacturing process – from engineering to virtual start of production. That means: simple usability, high openness for any data format, adaptability to specific technologies and facilities and a price structure that is in line with the market conditions. The possibility to understand the future of the digitalization for manufacturing processes is very important. The IMTS is offering an amazing platform to see what IoT and Industry 4.0 means, and how this can be translated for the shop floor processes. Live demos are the key in understanding the buzzwords and to make tangible the buzzwords for the different businesses. A trade show is always a chance to see if your understanding of the market requirements, fits the reality. Such a great exchange platform offers us the chance to discuss with customers, prospects and also competitors, resulting in the improvement of our products and making them the best in their class. We are trying to present at events not only what we have available, but, also pilot projects and like to discuss strategies. It is an exceptional way to get the feeling what manufacturing needs and helps us be fulfill clients expectations. This year we plan to show the digital twin based on a project pilot at HIROTEC, a tier one automotive supplier, and hope to understand better what the manufacturing requirements are regarding virtual commissioning. The goal is to present FASTSUITE not just as an Offline Programming software, but also as a software that covers the entire spectrum from layout planning, PLC validation and virtual commissioning. Chicago is a great place to be in September. Walking the Magnificent Mile (part of Chicago’s Michigan Avenue) is always fun. Usually after a long day at McCormick Place everybody is hungry and a little tired so I would also suggest a visit to Eataly, 43 East Ohio Street, Chicago, IL 60611. It is an amazing experience. Everything related to Italian Food you can find here. While walking the store you can have a taste of all kinds of different Italian products.